Paruppu urundai or pulse ball kuzhambu (பருப்பு உருண்டை குழம்பு) is a popular Tamilian preparation, which is made by different communities albeit with some variation in the recipe. My grandmother used to make it in the traditional Brahmin way, while I prefer to add onions to pulse balls (பருப்பு உருண்டை). Whatever be the recipe used, this kuzhambu is very tasty and rich in proteins. You can eat the pulse balls cooked in the gravy as such like a snack! Pulse balls also taste just great with our humble curd rice. Though one finds the name rather intimidating (! 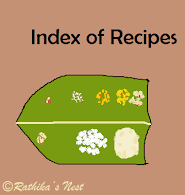 ), this kuzhambu can be made easily. Let’s set start with the recipe. Shall we? Method: Peel shallots and chop them finely. Heat sesame seed oil in a kadai, add chopped shallots and curry leaves and fry till shallots turn transparent. Switch off the fire. If you do not want to use shallots, then omit this step. Wash and soak Bengal gram dhal and toor dhal in water for 2-3 hours. Later, wash the dhals once again and drain the water completely. Grind the soaked dhals with salt, red chilli and asafoetida into a thick paste (கல் போல் அரைக்கவும்), using the mixer grinder. Transfer the paste to a bowl, add rice flour, fried oinions and curry leaves and mix very well. Shape into balls and keep aside (Fig.1). Soak tamarind in warm water for 15-20 minutes. Later squeeze tamarind and extract the juice. Add sambar powder, salt and jaggery to the tamarind juice. Bring it to boil in a kadai or a heavy bottomed vessel. Now add the pulse balls one by one, 2-3 at a time. If you add too many balls, they will stick together. Continue to boil the kuzhambu on medium flame. Once the balls are cooked, they rise to the surface (Fig.2). Transfer the cooked balls to a bowl and add the next set. Fig.2: Pulse balls rise to the surface once cooked. Once you finish cooking all the balls, add them back to the kuzhambu. Reduce the fire and simmer for 3 minutes. Switch off the stove and let the kuzhambu stand for 15 minutes. Heat the oil in tadka pan/spice pan (தாளிக்கிற கரண்டி), add mustard seeds, and when they start to sputter switch off the fire. Add seasoning to the kuzhambu and garnish with curry leaves. Serve hot with rice and poriyal or appalam.